GEORGE STEPHENSON (1781-1848) engineer, inventor and founder of railways and ROBERT STEPHENSON (1803-1859), his son. A Small Archive of Family Documents including an autograph Manuscript, being a short abstract of George Stephenson's will. 1. "Short Abstract of the Will of G. Stephenson Esq., made on his marriage but cancelled by will made March 1848". 1 page. 4to. 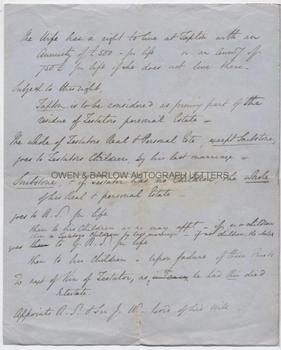 This is a note abstracted from his earlier will confirming the various annuities, bequests and legacies to members of his family and his wife's right to live at his house, Tapton after his death. Although such abstracts are normally prepared by solicitors in relation to the administration of estates an old pencil note on this document (presumably made by a lawyer or member of the Stephenson family) confirms that this is George Stephenson's handwriting. 2. Two letters to George Stephenson from solicitors Clarke & Friend, Fenchurch Street, 10th and 12 October 1836 concerning the sale of a property to George Stephenson by a Mrs Smith. The property is Number 16 Duke Street, Westminster and the letters are requests to complete the purchase as per the contract. 2pp. 4to. 3. Two legal notices served on George Stephenson requiring him to complete the purchase of 16 Duke Street, Westminster and threatening legal action for the recovery of damages for breach of contract. Both are identical in content and both are dated 18th October 1836. One was addressed to and served on George Stephenson personally and the other on his agent, Mr Thomas Ramel.. 2pp. 4to. 4. Declaration of Trust in the Matter of the Estate of the Late George Stephenson. The declaration is made by the executors of the late Robert Stephenson and concerns a sum of £26,666 appropriated by them to fund annuities bequeathed by George Stephenson to his widow. The declaration is signed and sealed by George Robert Stephenson (George Stephenson's nephew), civil engineer, and George Parker Bidder, civil engineer, who were the residuary beneficiaries of Robert Stephenson's will and were his executors. Dated 27th January 1860. 4pp. Legal folio, with its original envelope. 5. Three receipts for dividends on Bank of England stocks for 3 per cent consolidated annuities. Various dates 1859-60. Each is signed by George Robert Stephenson, George Parker Bidder and Charles Parker.3pp. 4to. 6. A very large pedigree or 'family tree' of George and Robert Stephenson, partly prepared in photo print by J. Halden & Co, 8 Great Chapel Street, Victoria Street, SW, and partly in manuscript with additions. Possibly this was produced in order to determine who were to be the benificiaries of the residue of George and Robert Stephenson's estates. An interesting collection of documents. It seems that there was some difficulty in 1860 as George Stephenson had made various bequests of annuities in his will but had not set aside or specified any particular fund out of which the annuities were to be paid. It is possible that the earlier abstract of his will, with the various notes of annuities and bequests which it contains was produced, at some point, as evidence of the testator's general intentions at the date of his marriage and how these may have altered following the revocation of his earlier will. This may be why someone noted on it that it was in George Stephenson's handwriting, as this would, of course, make it more persuasive as evidence of his intention. With an ever growing portfolio of works, the London & Birmingham Railway offices of George and Robert Stephenson's practice had become too small and in 1836 the practice moved from St John's Wood and leased premises in Westminster, No 16 Duke Street. This was situated close to premises at no.18, which had recently been acquired by Brunel. There had previously been some doubt about the precise address of this office. Samuel Smiles in his biography of Stephenson believed it was 8 Duke Street, although Bailey's biography cites 16 Duke Street. The letters with this archive suggest that it was, indeed, no 16, assuming George Stephenson completed the lease in accordance with the contract. George Stephenson was evidently dragging his feet over the matter and, although he had contracted for the leasehold, these documents indicate that the freeholder's solicitors were threatening to sue him for failure to complete. George Parker Bidder (1806-1878), one of the signatories of these documents, was a partner in George and Robert's consultancy business and a very able and innovative engineer in his own right.